US, 1981, 112 minutes, Colour. John Savage, Marthe Keller, Christopher Plummer, Nicholas Campbell, George Coe, Arthur Hill, John Marley. 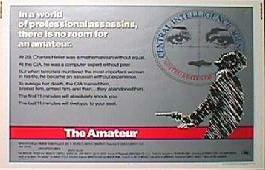 The Amateur is a reasonably entertaining CIA espionage story with a great deal of European location photography. John Savage is suitably serious in the central role of the man whose fiancee is killed by terrorist and who joins the CIA to revenge her. Christopher Plummer seems to enjoy himself as the head of investigations in Prague. The film is one of many offering critiques of the CIA and its methods. It highlights the spread of terrorism in the '80s. Direction is by Charles Jarrot who made his mark with such historical films as Anne of the Thousand Days and Mary Queen of Scots, with some Disney films like Escape to the Dark, The Last Flight of Noah's Ark and thrillers and romances like The Other Side of Midnight. 1. An entertaining spy thriller? The traditions of the espionage story? The facts and experiences of the '70s and 1980s? The role of the CIA, espionage, conspiracies? Terrorism? 2. The production values, the cast, American locations, European locations; Germany, Austria, Czechoslovakia? International atmosphere? The musical score for action and suspense? 3. The plausibility of the plot, the experience of terrorists and their killings, the role of the CIA, gathering information for governments, the United States and the Soviet Union? Hostages? Set-ups? Chases? Conspiracies? Vengeance? The operatives ultimately as expendable? 4. Where did audience sympathies lie? Audience judgments on terrorists, the role of the intelligence agencies? Motives for revenge? Working within the law, outside the law? Questions of justice, morality? 5. The introduction and Sarah, the detail, the emotional response to the terrorists, the hostages and the deaths? Charlie and his response? The terrorists and their activities, persons, deaths, warnings? The discussions about the situation? 6. Charlie and his personality, relationship with Sarah, his work? Going to the CIA? His skills? His using them to force the CIA to employ him? Memories of Sarah, motives of vengeance? The television, the package, the funeral? 7. Sarah's father and the credibility of the vengeance? His relationship with Elizabeth - and the parallels with Sarah? An ordinary man moved to vengeance, the executing of justice? The possibility of his plot and action succeeding - but the intervention of the CIA, plots and counter-espionage? 8. Charlie and the detail of his training, his hold on the CIA, Anderson as his control? His readiness, the move to Czechoslovakia, the various routines in seeking out agents, his cover? Encountering Elizabeth, the relationship with her? Her saving him? The presence of Lakos? Charlie in Prague, tracking down Gretchen and Rodzenko and Gretchen's death, the encounter with-Botaro and his death in the hotel pool? The tracking down of Schraeger, Schraeger taking Elizabeth as hostage? Anderson revealing that he was a double agent? Schraeger's craziness? The deaths? Lakos and his hold over Charlie and, Elizabeth? The deal for letting then go? 9. Elizabeth and her background, agent, successful, work in Prague, relationship with Charlie, savin him, the deaths, her being taken, Schraeger's treatment of her, the possibility of a happy ending? 10. Christopher Plummer and his style as Lakos? His role in intelligence, his contacts, his surveillance of Charlie, his final intervention? The final deal? 11. Anderson and CIA operatives, their role, cover-ups, lies? His death? 12. Schraeger and his work as a terrorist, as a CIA agent, the pressure on him, taking Elizabeth as hostage, his going berserk? Death? 13. Themes of the cold war, agents, loyalties, morality, matters of life and death? The newspaper headlines of the '80s giving credibility to the incidents and characters?